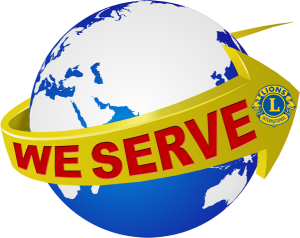 Well, our holiday break is over and what better way to start the Fairfield Bay Lions Club articles than with one that the Lions are all about “WE SERVE.” The Lions Worldwide Week of Service kicks off January 10, 2015. The Worldwide Week of Service is an international event that brings Lions around the world together for a special week of celebration and service. It’s an opportunity to strengthen our community. In conjunction with the Centennial Service Challenge (designed to highlight 100 years on Lions service in 2017) there are Lions who are invo;ved with several projects such as youth programs, vision programs, hunger programs and environmental programs. Here in Fairfield Bay many of our Lions Club members have been involved with the Hippe Recycle Center as volunteers over the years. My own association with the Recycle Center started when I met Lion John Edmiston (who explained the program to me) and would up recruiting a volunteer for the center and later a new Lion. Currently the Hippe Recycle Center is in need of additional volunteers. Volunteers are asked to spend one 3 ½ hour shift each 28 days assisting those who come to the center by showing individuals where to place their materials. Currently 1 volunteer is needed on Tuesday, Wednesday and Friday mornings from 9 a.m. – 12:30 p.m. and there are two openings on Thursday afternoons from 12:30 – 4 p.m. If you are a Lions Club member or a member of the community and can fill one of these openings please drop by the Hippe Recycle Center or call the center @ 884 – 4184. BINGO has resumed on Tuesday evenings with doors opening at 5:30 pm and the first game called at 6 pm (weather permitting). There is a $500 blackout game played each week with increasing numbers to win. Our first regular meeting for the Fairfield Bay Lions will be Thursday, February 12 with dinner served at 5:30 p.m. and the regular meeting and guest speaker at 6 p.m. For information on becoming a Fairfield Bay Lions Club member please contact Lion Membership Chair Robert Smith @ 253-0552 or Lion Club President Ed Roberts @ 884-3679.